Twitter and other Social Media can be full of random rubbish, but can also contain useful information. Personally, I use Twitter for work-related tweets about 95 percent of the time, and I choose the people I follow carefully so that I’m not overwhelmed by a flood of tweets. As I’ve said before: people who I follow are my human filter to the Twitter Noise. And I hope that is vice versa. 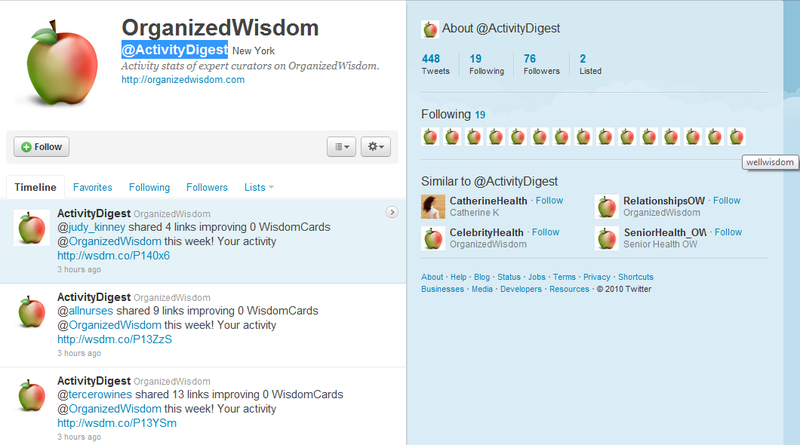 Organized Wisdom (http://organizedwisdom.com and @organizedwisdom on Twitter) is a 3-4 year old company that uses a similar approach to filter useful health information out of the daily junk. 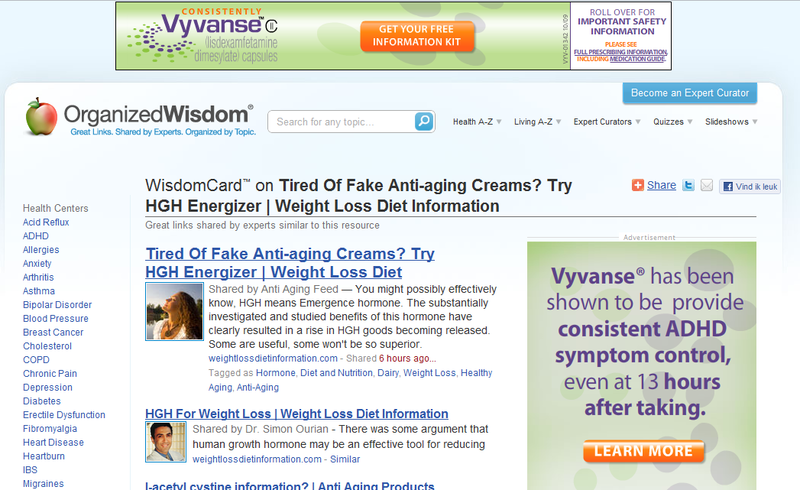 Organized Wisdom has created a new way for people to use the internet to solve their health problems by using experts. We think experts are the missing gap between two worlds: heavily simplified health encyclopedias & dictionaries and complex stuff on the internet (where you are quickly overwhelmed by all the health stuff). OrganizedWisdom® uses WisdomCards™ , a unique service which helps people easily discover great links, curated by experts and organized by topic. In principle this is an excellent idea, and that is why I originally joined Organized Wisdom. So far so good. Besides being a creator of content (which is nothing more than being a source for automatically created links present in my health-care related tweets), I’m also a “consumer”. 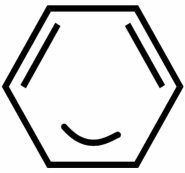 Because I’m interested in Endocrinology I follow @EndocrinologyOW on Twitter. There are many other OW topics on Twitter, that you can follow. Recently Organized Wisdom launched a new account @ActivityDigest, which -it won’t surprise you- gives an activity digest of the curators. Apparently to stimulate “engagement” (Oh wonderful CEO-terminologies). This is why I got this tweet in my twitter stream (I don’t follow @ActivityDigest, but I see its tweets once it mentions me). 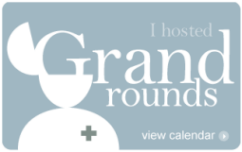 I felt flattered: “recommended as an expert curator for Organized Wisdom“…. That sounds like any scientists could only dream of. And before I realised it, I retweeted the message (repeated the message to my twitter stream). Immediately I felt a bit uncomfortable. And this feeling grew as I saw almost everybody in my Twitter stream being labeled as an “Expert Curator”. … and everybody retweeting his/her “pat on the back” and congratulating each other…. Note (1) the real surprise of some people (Wow, I never heard of Expert Curator for quality links before) and (2) the chaff (endless beauty) between the wheat ((BMJ_Group, American_Heart). I mean: if some of these accounts would start following me, I would probably block them and report them for spam! Really! Activity Digest continues its activities. Now everybody knows he or she is a curator, it tweets what the curators have achieved this week. Probably OW is hoping curators retweet their achievements and spread the word for them. We are not only used as living filters, but even more so as “living ads”! It made me frown, but the worst thing that struck me today is that the twittered information isn’t really filtered for quality. About a quarter is what I would call SCAM or at least CRAP. Similar cards are antiaging medicine that gets at the hormone causes, supplements for diabetes support and what about the Type 2 Diabetes Natural Treatment-card. Cinnamon as treatment? Anyone? 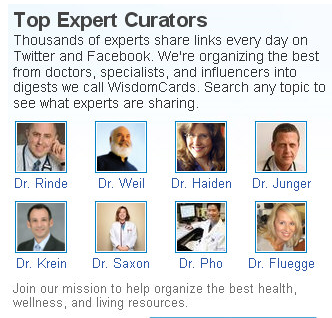 And of course there are also chiropractor WisdomCard™ cards where “expert curators share great links about chiropractor”. Organized Wisdom uses the credibility of me and other curators, including so-called “top expert curators” as Dr Pho (Kevin MD – blog), to cover up the incredibility of others, with the intention to lure users in. Who doesn’t believe top curators like the ones below? Who doesn’t want to be considered one? Going through the “expert curator” Twitter search, I saw (only) one very sensible man, EdBennett, who manages web sites for a large academic medical center and creates overviews of social media usage by hospitals. Friendly, he asked to be removed from the Expert Curator list. I think I will try the same, although (considering the answer of dr Ves), that may not be a sinecure. Perhaps we can try a concerted action. You know, the power of the crowd…. 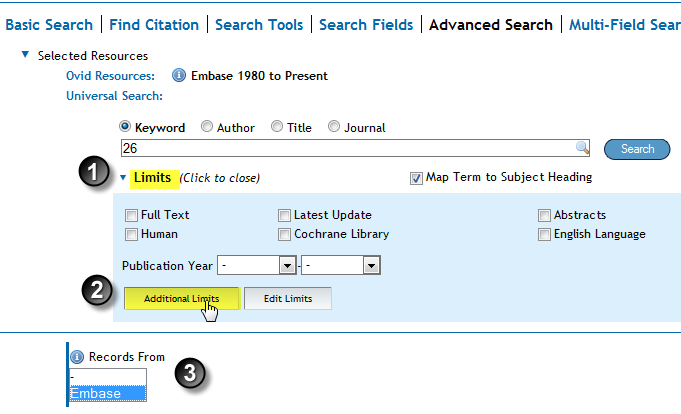 Added 2010-11-12: For more striking examples, please read the comments. 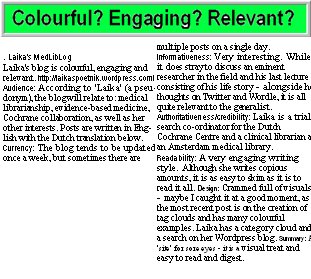 (anti-quack people “recommending” homeopathy treatment of cancer; dr ves -true expert on asthma beaten by the author of slim-fit-health.info/newsletters/fat-loss-now/…..
You are correct about some health sites’ contents written by people with limited or non-existent medical knowledge or training; the public at large do not know this. 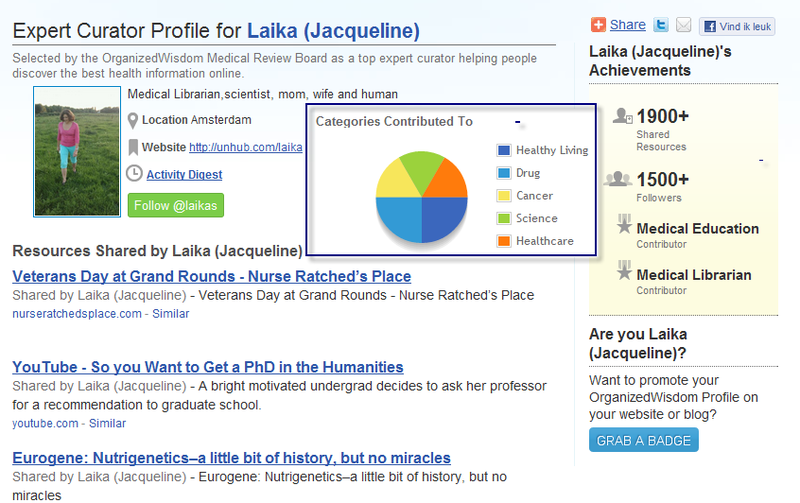 In fact, one of my neighbors, a “MA” or “Medical Assistant,” writes for OrganizedWisdom.com .